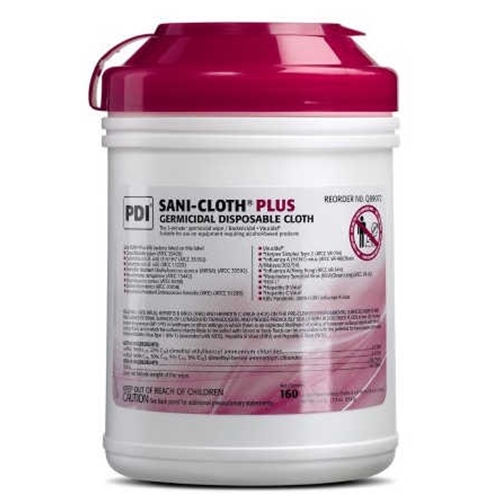 PDI Sani Cloth Plus Germicidal Wipes from HealthyKin.com are an EPA registered hospital-grade disinfectant to accommodate the many situations and hard non-porous environmental surfaces found in healthcare settings. I give a 5 to healthykin.com. I give a 4 to the product since they didn't take the extra step and do a kill test for both herpes simplex like the competition. You'll notice they both aren't listed. Great for childcare centers for tables for eating and infant/toddler changing tables. Quick dry. My issue is that every time I purchase the sani-wipes-my password has to be changed. It's a constant problem but has no reflection on the excellent product. Love the x-large 8"x14" wipes as they cover a large area of cleaning fast. They are easily dispensed and sturdy. Fast great delivery as well. These wipes are great for sanitizing countertops, doorknobs, and quick cleanup. I recommend these for every home, especially during flu season. Works great, easy to use. Healthykin is easy to order from. Happy with service and product. We are very happy with these wipes. They arrive quickly, in good shape and we use them all over our medical office for de-germing purposes. Used every day! Love these wipes! Shipping was super fast. Will repurchase. Best value! Shipping time was excellent....came much sooner than expected! Def will be purchasing again.